3. promote open and flexible education to enhance educational access and quality. 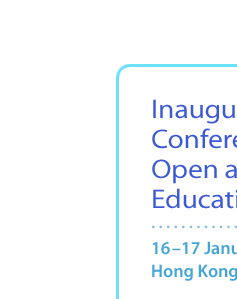 The theme for the Inaugural International Conference on Open and Flexible Education is ‘Making Learning Open and Flexible: Emerging Modes and Approaches’. It will focus primarily on exploring which of the latest technologies and innovations can facilitate the further development of open learning towards a more flexible and personalized mode of education catering for the diverse needs of different learning communities and how these technologies can do so. 6. the use of Web-based open educational resources, e.g. massive open online courses and other large-population courses. Papers submitted for presentation should be in English. Papers in Chinese will also be considered, and should be submitted together with paper titles and abstracts in English. Accepted papers in Chinese will be presented in Putonghua. Accepted papers will be included in the conference proceedings. Authors of selected papers may also be invited to submit an extended version of their papers for journal publication.